We seem to be having a moment here lately. The situation is this: I'm pretty sure my daughter is out to get me. I think each day she's trying to weaken my defenses by turning me into a frustrated, weepy, compliant drone without the willpower to argue another point, reason one more debate, or deny her a 2-popsicle breakfast. Anna spends most of her time in Steve's care while I work. I'm home, but he keeps her out of my office for most of 8 hours a day. They run errands, take naps, visit playgrounds and the beach. By his account, she's 'sometimes' fussy. Apparently, she saves the big guns for me. I have tons of guilt about not enjoying all of my time with Anna like I used to, before she could rapid-fire demands at me, throw low-grade, moaning tantrums with Iron Man stamina, or turn quick runs for milk into 50-minute exercises in diaphragmatic breathing. But lately, every move is a negotiation. Every request is met with defiance or some creative runaround involving 3 pairs of underpants, 2 sets of shoes and a burning desire to read Cat in the Hat 4 times. Last week we took a stroll together to the grocery store, where her good mood held right until we hit the automatic doors. She decided she urgently had to have something from each aisle we passed, so while she yelled about yogurt, Pop-Tarts and watermelon, I coolly reminded her she had all of these things at home. I tried to distract her with the giant Tony the Tiger cutout standing above the milk section, I screamed things in my head that I'd never say out loud. I just wanted to buy some dinner, she wanted to demonstrate the Testing Boundaries portion of toddlerhood. I sang to her on the walk home. I wiggled the stroller back and forth, while she writhed against the straps and sobbed "I want to WALK!" Row, row, row your boat.... I made a conscious effort to keep my jaw relaxed and my pace steady. I managed to keep my cheeks dry. Of course we also have some really great moments. I love her face at my bedside in the morning, even if the sun is just barely up. Before that, I love hearing her bare feet pat down the hallway. She and Steve sit at the kitchen bar and have breakfast together, I could sit on the couch and watch them there all day. Sometimes after day care I'll bring her to the beach — the salty air corkscrews her curls tight, her bathing suit baggy on her lanky frame. 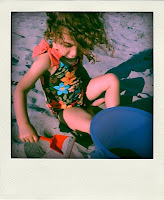 I watch her play in the sand, my beautiful girl in the late, golden sun. She is amazing, and I remind myself we're just in another phase. So what do I do here? As she gets older I feel somehow less adept at sorting through my job responsibilities in these transitions. Do I comfort her? Continue distraction techniques? Introduce consistent, organized discipline? Find someone to sponsor my stay at Canyon Ranch until she's 5? Now that she's so much a person, I feel more pressure to be doing right — it's like being in those last few years of school that colleges give a crap about. There's no more winging it, right about now I'd like a guidance counselor.